Tomorrow we will be introducing a new Gastronomista Hostess, a lovely, charming, and stylish cheesemonger who will be teach us all we can possibly learn about the wonderful world of cheese - domestic, imported, stinky, silky, runny, hard, aged, ashen, washed rind, domestic, raw and runny. 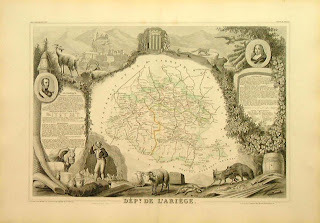 To whet your palate, take a look at these incredible original French cheese maps, hand-colored steel engravings drawn under the supervision of famous cartographer Victor Levasseur in Paris in 1854. The maps are available for purchase from the Grace Galleries in Maine for only $85 a pop. In the cheese shop of our dreams, these maps will line the walls. DEPT. DE L'ARIEGE. Southwestern France. 12x16. Cheese: Cierp De Luchon. Auzat. Cheese: Banon. Entrechaux. Poivre D'Ane. Camargue. Tomme Arlesienne. DEPT. 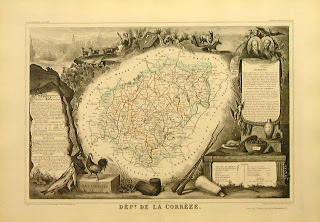 DU CORREZE. South Central France. 12X16½. DEPT. DE L'OISE Northern France. 12X16. These maps are commonly sold as "Wine Maps" or "Cheese Maps" but in fact they are just maps of various French departments. 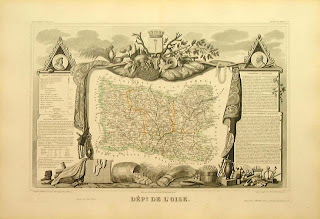 That said, Levasseur, a Frenchman himself, elaborately engraved the borders of his maps with images important regional products, including cheese, wine, bread, grain, distilled spirits, wild game, etc. 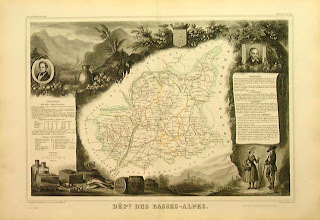 The atlas from which these were drawn, Levasseurs "Atlas Nacionale de la France" is possibly the most elaborately decorated atlas of the 19th century.